I’ve been awarded a studio residency at Ocean Studios in Royal William Yard and, having moved in there, I’ve been concentrating on making a large illustrated bowl for an exhibition about the Port Eliot Festival. My degree show work was selected for the Royal West of England Academy’s Autumn Exhibition in Bristol. I’ve also taken part in two Open Studios events – one in Plymouth and one in Kent – which were exhausting but well worth doing. My plans for what I wanted to work on – illustrated ceramics – had crystallised in the last few months of my degree, and that is exactly what I am doing at the moment. I’m a bit of a perfectionist and struggling to deal with self-imposed pressure was a constant challenge. Also, as a mature student, I really struggled with learning how to use the software needed on the course, such as Photoshop. Initially, it would reduce me to tears within minutes. I am really pleased to write that with a great deal of help from many people the fear of using it has gone and I now know that I can use it to achieve what I need to. What are the best, most exciting or fun things that you have done in your career? Three things: firstly, being longlisted for the Folio Society Illustration competition and going up to the Awards Evening in London; secondly, opening the kiln to see that my work for my degree show had survived its fifth firing. Lastly, winning the 'Student and Recent Graduate' prize at the Ruskin Prize 2017 awards evening and meeting all the other shortlisted artists there. I wish I had kept up doing the regular exercise that I was doing before I started the degree, such as tennis. It rather fell by the wayside and it would have helped me to avoid getting too stressed. To keep drawing every day and really look at the world around you. The computer screen is great, but everything that appears on it has been mediated through someone else. Widen where you get your information from and keep questioning everything. I learned technical skills such as printmaking, computer skills, and writing a dissertation, but even more importantly it helped enormously with my confidence. I discovered that even at my stage in life, I can still learn and that it is really good to keep challenging myself. The excitement of buzzing with ideas and plans every time we’d start a new module. Also, the sheer luxury of having three years to focus on learning. I have just started to do Facebook, so I will be using that to keep in touch with the students who graduated with me. I do keep in touch with the lecturers. I think that virtually anyone could enjoy and benefit from doing the illustration degree because it is so wide ranging and allows you to research so many fascinating areas of our lives. One of the final year modules was really helpful as we learned about the business side of being an illustrator and getting us to think about the next stage. The disability support I received through the University was also vital to my completing the degree. Look after your mental health: it is a precious thing. Try to fit the things that you know will really lift your mood into your daily routine. 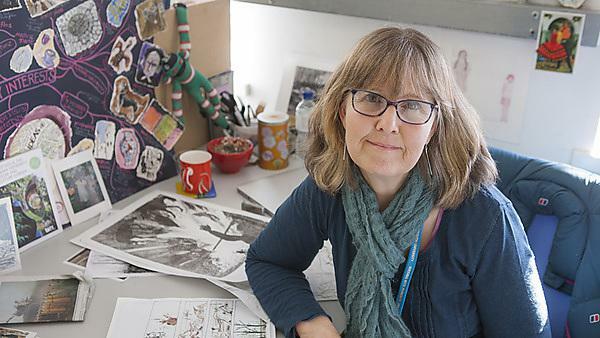 For more information about studying illustration, please visit our BA (Hons) Illustration page. For more information about our range of courses within the School of Art, Design and Architecture, please visit the school page.